When you’re on the road and traveling, you often have to keep a strict schedule. Hotel check in and out times are important and if you are traveling for business, you need to make sure that you are on time for all of your meetings. A good travel alarm clock will keep you on track and here we’ll show you the best travel alarm clocks. No snooze button so you actually get up! What Do I Need To Look For In A Travel Alarm Clock? The type of travel alarm clock that you choose will depend greatly on what kind of traveling you do and your own personal preference. Here are a few things to keep in mind when looking for the best travel alarm clock. Both analog and digital clocks are easy to find, so this feature is going to depend largely on your own preference. Analog clocks are very simple and generally don’t have many complicated features. Most analog clocks run on batteries and are very affordable. A few downsides to analog clocks is that they might have a loud ticking noise that could keep you awake if you are a light sleeper. Also, some people prefer to be able to glance quickly at a clock and know the exact time. A digital clock is going to be a little bit more advanced when it comes to special features. These will also run on batteries, but there is no ticking sound and time might be a little more precise than analog clocks. Digital clocks also tend to be more expensive, but you can get more information out of these types of clocks. You want to make sure that you purchase a travel alarm clock that is going to wake you up. Some cheaper varieties might only come with one type of sound and one volume level. If you are a heavy sleeper, this isn’t going to help you out. Look for a travel alarm clock that comes with different volumes of sound. This way you can customize how loud your alarm is when it goes off. You can also find travel alarm clocks that will start soft and progressively get louder as time goes on. This might help you wake up gradually rather than with a sharp blare of a horn. Also, try to find an alarm clock that has a sound you want to hear as you wake up. If you don’t like the traditional beep of an alarm clock, you can find ones that allow you to choose your sound. You can wake up to the sounds of nature or wake up to the radio. There are even some alarm clocks that will let you program your own music as a way to wake up. A travel alarm clock needs to be even more durable than your regular alarm clock. It is going to be packed in a bag and possibly crushed under other bags during your flight. You don’t want to have to replace your alarm clock every time you need to travel. Find a travel alarm clock that is made of sturdy material such as metal or plastic. There are even some brands that have hard rubber alarm clocks that can be dropped and beaten up without damage to the clock. Travel clocks that are made with glass or other fragile and flimsy materials are certain to break at some point during your travels. 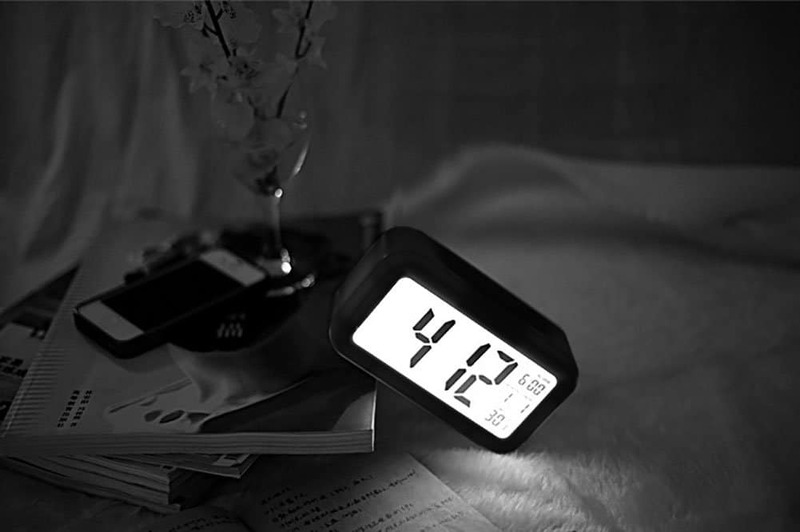 You might also want to find a travel alarm clock that folds up. This feature allows the clock to not only be protected during travel but adds another layer of durability by covering the clock screen. When you’re traveling, the last thing on your mind is probably how to work your travel alarm clock. While you can find some models that have a ton of bells and whistles, you want to find one that is easy to use. Make sure it is simple to set your alarm so you don’t have to worry about missing a wake-up call or a scheduled event. This becomes even more important if you are traveling across time zones or internationally because your internal clock will already be off, and you will have to rely completely on your travel alarm clock. What Special Features Can I Get On A Travel Alarm Clock? A good travel alarm clock can do more than just tell time. There are a number of features that you can find to help make your trip easier and more enjoyable. This is a really nice feature if you have multiple things scheduled in your day. A dual alarm will allow you to set two different alarms rather than just one. There are also a few clocks that will let you set more than two and will keep them set for each day. That way you don’t have to set an alarm every single day, you can do it once and be set for the week. These might not seem like important things on a regular day, but when you’re traveling you can easily lose track of the date. Many travel alarm clocks will also tell you the date along with the time. You can also find clocks that will display the entire calendar, so you can plan meetings or schedule events while traveling. Most clocks read in 12-hour increments, but you can also find travel alarm clocks that will read in military time. If you are more comfortable reading time this way, this could be a nice feature. After a long day of traveling, it can be nice to unwind with music. If that is important to you, you can find a travel alarm clock that has a radio as well. With the rise and popularity of smartphones, many travel clocks have USB abilities to connect to your phone so you can play your own music. You can also find an alarm clock that will give you the weather for your location. This is really nice if you are in an unfamiliar place and don’t have access to local news. 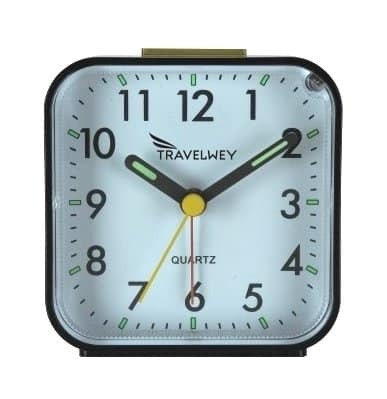 The TravelWay clock is a very simple analog alarm clock. It is made of durable plastic that will protect the clock if it is dropped or smashed down into a suitcase. The hands are illuminated so you can see the time in the dark but not super bright to keep you up at night. Two nice features of this clock are that the alarm gets gradually louder as it goes on. This is great for waking up gently instead of all of a sudden. The other nice feature is that it is completely silent. Unlike other analog clocks, there is no ticking or humming. If you need it totally quiet when you sleep, this is a great alarm clock. 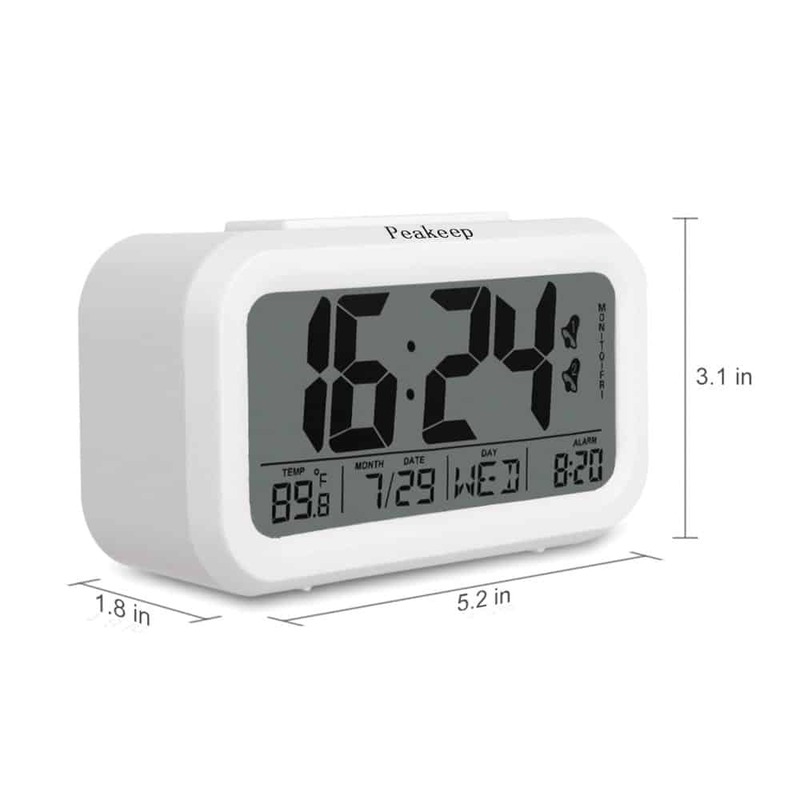 This clock is a highly durable compact clock that is extremely accurate. It is set via radio to be in synch with the US atomic clock. It also adjusts automatically for daylight savings time. The Ambient Weather clock displays not only the time but also your alarm time, the time zone you’re in, date, month, the day of the week, indoor temperature, and the strength of your radio signal. There is a backlight to this clock that adjusts to the amount of light in the room so you can always see the time. All the readings can be displayed in five different languages and four different time zones. There is a simple one touch snooze button and two different color options. If you’re a fan of simple and retro, this clock will be the best choice for you. This alarm clock is a battery operated analog clock that has a silent second hand so it won’t disturb you while you sleep. This is a great alarm clock for heavy sleepers because the alarm sound is very loud. There is a button for a backlight so you can see the time even in the dark. There is no snooze button because you have to flip the switch off on the back of the clock. The loud alarm is good for heavy sleepers, but if you tend to fall asleep after you turn off your alarm this might not be the best option for you. This clock is also by Peakeep, but it is a digital clock that comes with a few more features. It is battery operated and also has a large number display so the time is easy to read. It also shows the date, day, temperature, and the time of your alarm. You have dual alarm abilities with this clock, so you can set a weekday alarm and a weekend alarm and not have to worry about resetting the time. There is also two backlight options, soft and bright, so you can see the time no matter where you are in the room. This battery operated digital travel alarm clock features a 4.5” LCD screen that is similar to a smartphone display screen. 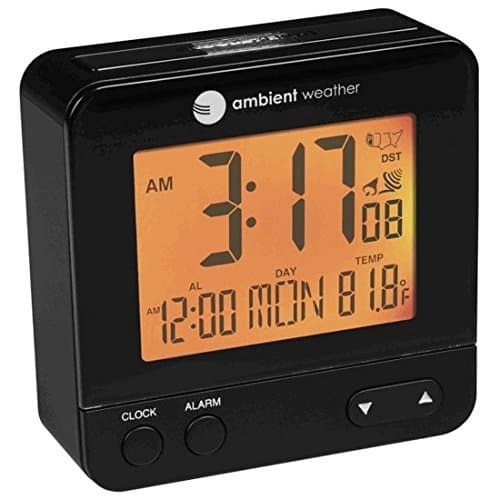 It tells the time, date, temperature, and alarm time with the capability to set two separate alarm times. It will remember the alarm time too so you don’t have to keep resetting the alarm. It also has a smart light sensor that will adjust the backlight on the clock screen depending on the level of darkness. You can also turn the backlight off completely if you are sensitive to light while you sleep. It is easy to program your alarms and you can use 12 or 24 hour time readings.